Cost, speed, and reliability are all important to consider when designing a network, but balancing all three is no easy task. As your organization expands, you need a resilient, fast, and secure network—especially in large, distributed environments. And it needs to be affordable. This is where a software-defined WAN (SD-WAN) comes to the rescue. And deploying it today can provide a quantifiable competitive advantage. Gartner estimates SD-WAN has less than 5% market share today, but predicts 25% of users will manage their WAN through software within two years. "Secure Enterprise SD-WAN for Dummies" guides you step-by-step how to manage and secure digital networks with SD-WAN, with instructions even the most novice networking professional can understand. 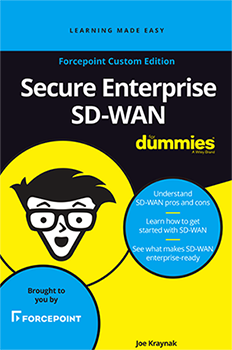 Read “Secure Enterprise SD-WAN for Dummies” and gain a competitive edge today!